Our stock sizes are held on rolls with a 76mm internal core manufactured on high quality white vellum face paper with a permanent adhesive. Please call for an up-to-date quote. We can also supply as a special making (turn around approx 5 – 10 working days) on any imaginable size, material, adhesive, core size, plain or printed combination. We can supply on 19mm, 25mm, 44mm or 76mm cores. We can also supply as continuously fanfolded as an alternative. 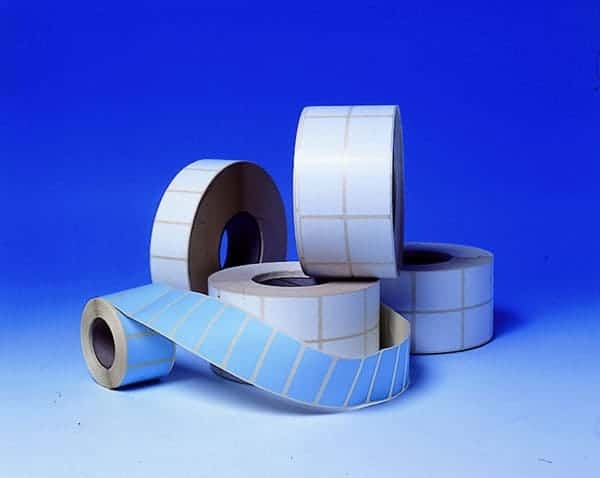 If required we can supply labels Plain or Printed from 1 colour up to full colour process + varnish. 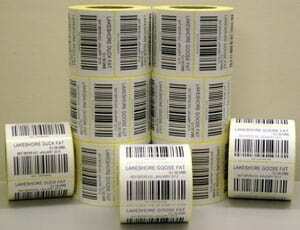 Please see our Printed Labels page. We can supply on all manner of materials: matt paper, semi gloss paper, gloss paper, vinyl, polypropylene and polyester to name but a few. We can supply on numerous adhesives for example: standard permanent, hi tack permanent, deep freeze, food safe, removable and glass removable. If you have not got the in-house equipment to print variable information & barcodes then we can do that for you using our stock labels we can print barcodes, consecutive numbers and other variable information.